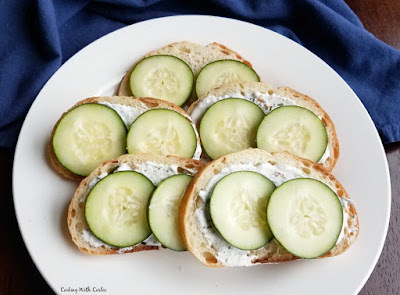 Like an open faced tea sandwich, these cucumber bread bites are a great appetizer especially in the spring and summer. Fresh, simple and great for making a bit ahead! We went out the night before Easter and there was this whole thing. I won't go into the details, but it still makes me laugh. I'll just leave it at we didn't get much sleep and we weren't looking or feeling our finest on Easter morning. It was the perfect way to meet a family full of strangers! We were meeting our "Springfield mom" and her in-laws to spend the day. We got there and she had a tray of this cucumber bread. Tish and I about polished it off! We have made it regularly since. Whenever Tish came to one of my BBQs, this is what she brought. It brings back a lot of good (and some really funny) memories! Spread over bread slices and top with cucumber slices, you may want to cut the cucumber slices in half if you are using a baguette. It is! Really simple, but really good! 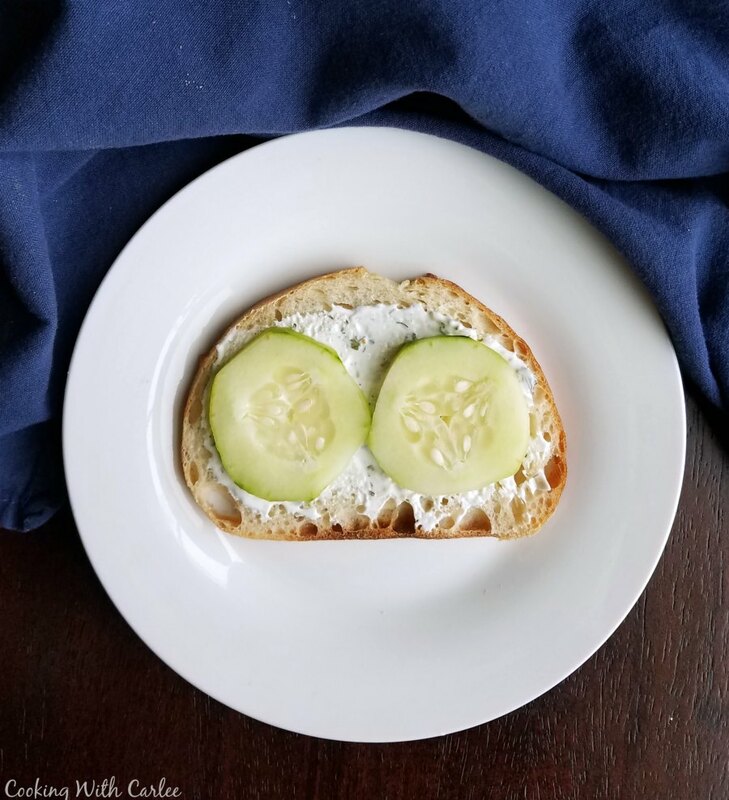 love cucumber sandwiches in the spring and summer! 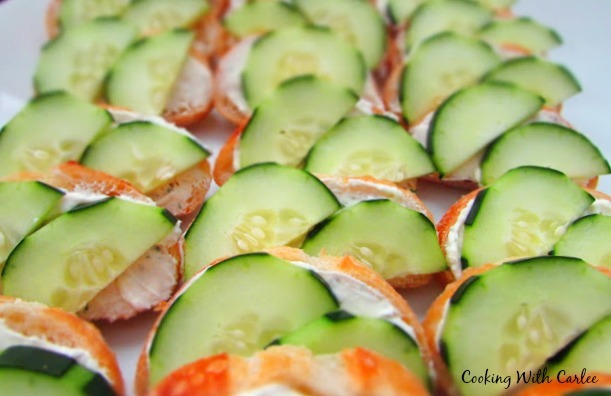 these sound really delish and perfect for little tea parties with the grands! Appreciate your sharing with Snickerdoodle Sunday! I was thinking it might be fun to do a "tea party" type girls night some time! Have cute "girly" finger foods on china and these would be fun for that too! I ave never heard of such a thing! I have read about ppl eating cucumber sandwiches in the old day but I can see how this could be kind of addicting! Cool, creamy! 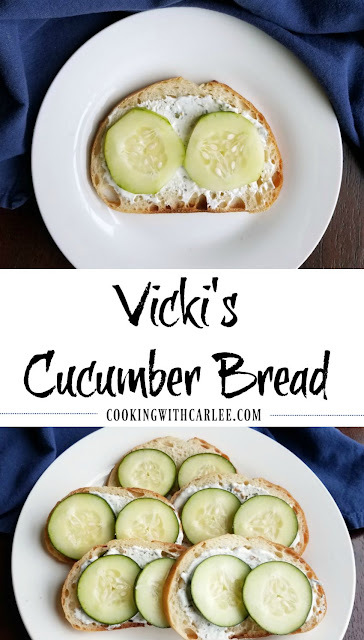 I think it is very similar to the cucumber sandwiches, but I love to serve them open faced! They are addicting and great for a spring or summer day!